One of the most popular decor trends in recent years is the modern farmhouse style, which takes a warm, rustic twist on industrial chic. Much like the name suggests, it stylishly fuses the warmth and homeyness of a farmhouse style and adds in cool, modern touches to keep it from being stuffy or old fashioned. A big part of nailing this style involves getting the right lighting fixtures. 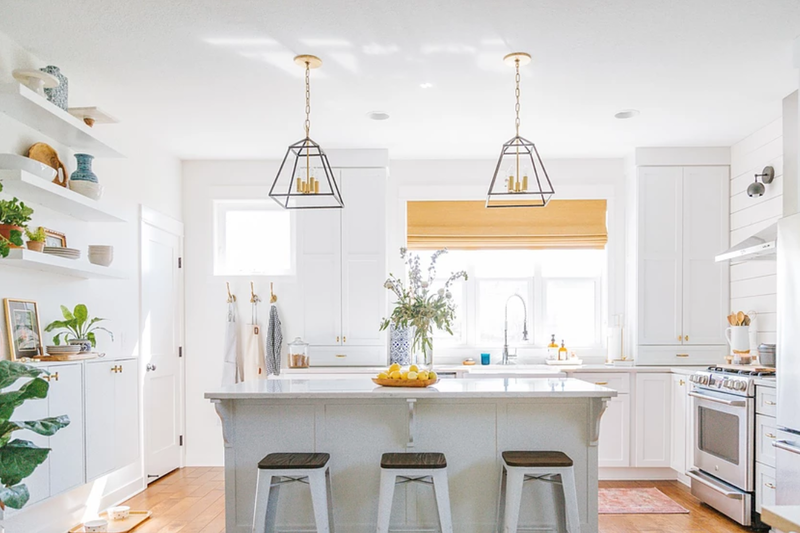 Light fixtures often serve as a focal point in the modern farmhouse room, and features to look for are simple styles, mixed metals, class, exposed bulbs, and wrought iron accents. To help you pick the perfect fixtures, we’ve rounded up some of our favourites for you to choose from. The Webster fixture is modelled after a bell, and offers a fresh and modern look on this timeless structure. Mixing textured black iron with metals, it is practically the definition of modern farmhouse. If you’re looking to add a touch of glam to your modern farmhouse style, the Sutton is the perfect fit. This chandelier from Troy Lighting manages to combine a rustic country feel with a high end finish to give you the perfect statement fixture. 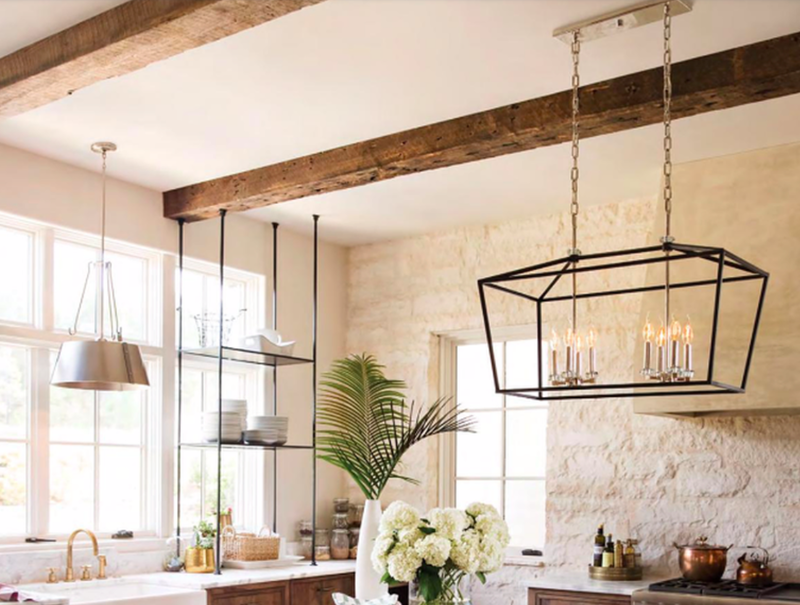 The chain link and unique shape of the Sphericon pendants make them an eye catching addition to a modern farmhouse space. Available in aged gold brass and chrome, and clear or opal glass, you can choose the option that perfectly suits your taste. 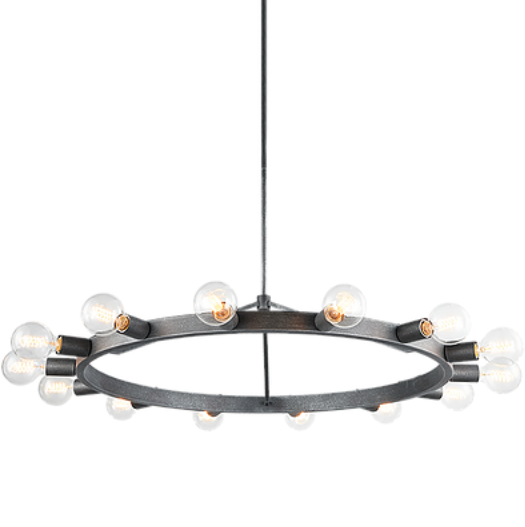 Another sleek yet rustic chandelier, the Marquis gets its industrial look from its exposed bulbs and black finish, while keeping a rustic feel from its circular shape. We particularly love these piece over a dining room table. 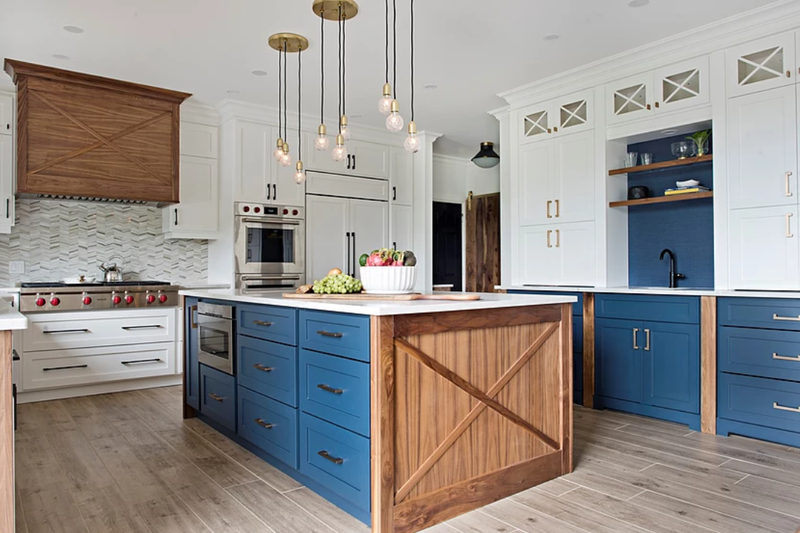 The Marlow fixtures from Hudson Valley Lighting are definitely more industrial than modern farmhouse, but they pair perfectly with this otherwise rustic-style kitchen to add a fresh and current feel. 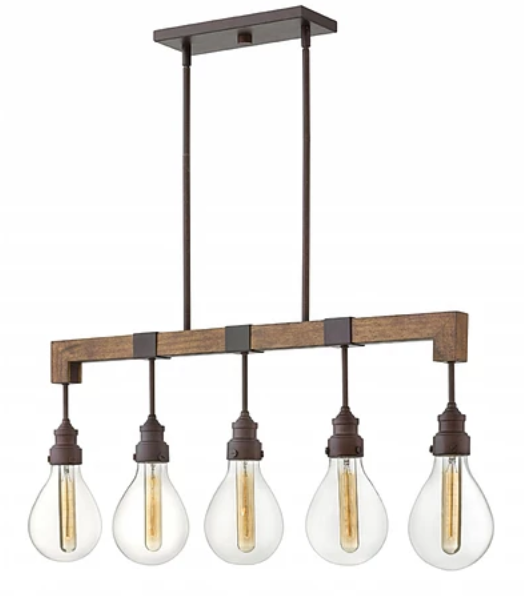 Combining industrial finishes with rustic wood accents, it doesn’t get anymore modern farmhouse than Hinkley Lighting’s Denton fixture. 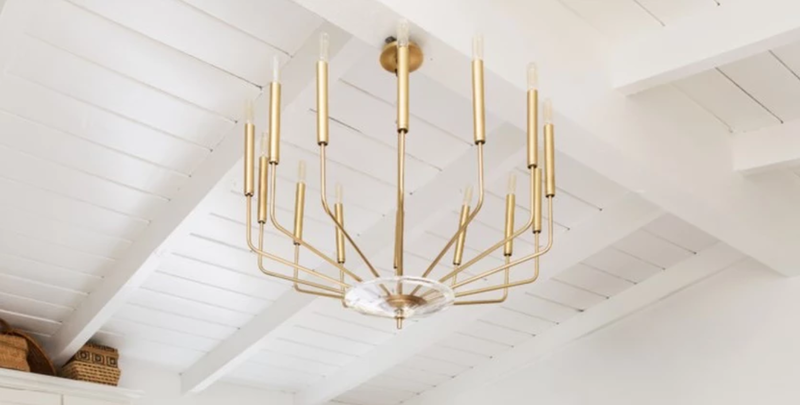 The collection offers a variety of styles, from wall sconces to chandeliers, so you can incorporate this look anywhere in your space. 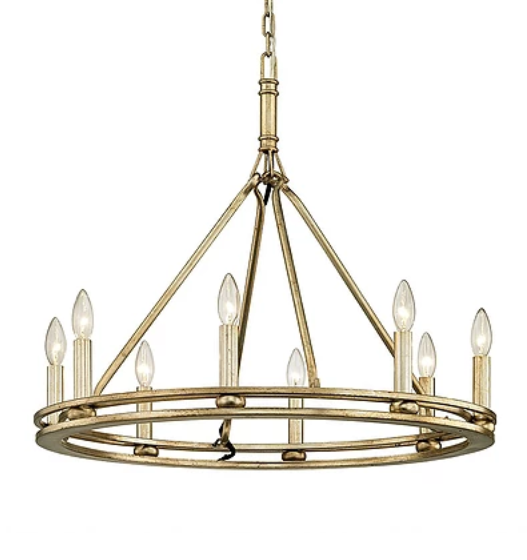 Hinkley offers a great selection of modern farmhouse fixtures, but one of our favourites is the Stinson chandelier. The candle bulbs and iron cage give it a lantern look, that is somehow traditional and modern at the same time.